Did Y'all Know Issa Rae Rocked All Black Designers At The CFDA Awards? 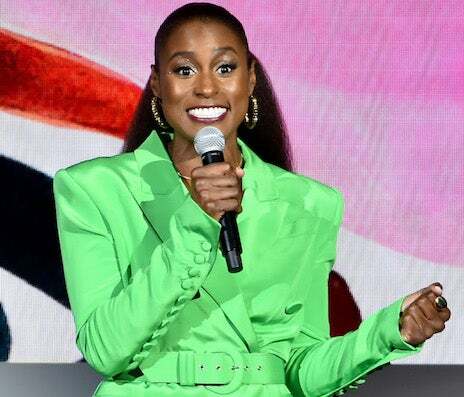 On Monday night, Rae made history as the first black host of the CFDA Awards and she did so by wearing looks exclusively made by Black designers. The first look? Rae walked the red carpet in a much talked about custom piece by Pyer Moss — thanks to its dazzling Swarovski crystals and belt emblazoned with the phrase “Every n—- is a star.” Designer Kerby Jean-Raymond, is known for sparking social commentary through his pieces – and he did not let this moment go without doing just that. He was also nominated for the CFDA’s Emerging Talent award (although he sadly did not take home the honor). Then, she opened the award ceremony in a Sergio Hudson pantsuit. Hudson’s designs have also been rocked by Rihanna, Janelle Monae, and Kelly Rowland — just to name a few. Rae continued the evening in a custom gown by celebrity stylist, Jason Rembert. The stylist, who has also worked with Winnie Harlow and John Boyega, blessed Rae with his own original piece. Later, the Insecure star changed into an original piece by Shanel, who is a budding student at Parsons. One of Shanel’s designs were recently commended and worn by Solange at the 2018 Parsons Benefit. Rae ended the evening partying the night away in a gown by Victor Glemaud. Glemaud has an impressive history in fashion publicity, and held directorial positions at Paco Rabbane and Tommy Hilfiger. It’s no surprise that his own collection consists of perfection. May we also note that all of Rae’s ensembles were complimented with accessories by black jewelry designers – Mateo Jewelry, Shauna Neely, and JLANI Jewels. It’s been proven that the statement of “there not being enough black designers” is no longer an excuse. We’re looking forward to seeing these designers will be recognized at next year’s CFDA Awards.